With Megan out eating $1 hamburgers, I decided to get in the kitchen and whip something up. I didn’t know what, but after thinking for a minute, a meat pie came into view. 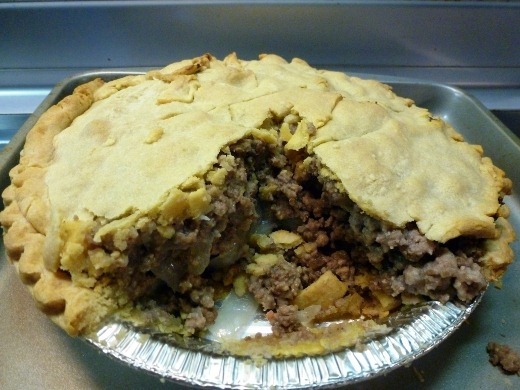 I haven’t ever made a meat pie before, but I’ve eaten my fair share — particularly at my Grandma’s house. It turns out that it’s relatively straightforward to make, and delicious. I began by boiling some water in the microwave and mixing in a cup’s worth of instant mashed potatoes. 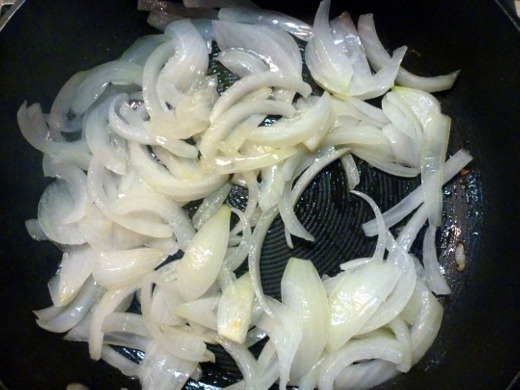 While that was happening, I was near-caramelizing a sliced onion until it got nice and sweet. 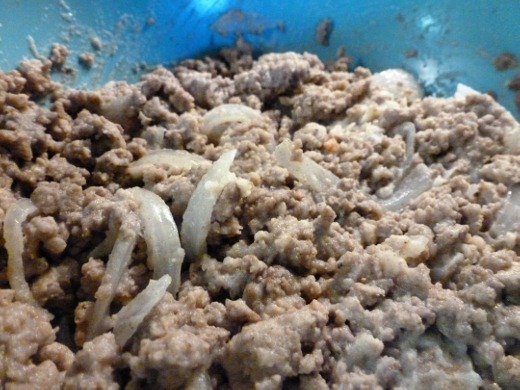 Once the onions were ready, I tossed those into a big bowl along with the mashed potatoes, and turned my attention to the meat. 1 pound of ground chuck, and 1 pound of ground pork. That’s a lot of meat! I browned the 2 lbs in the same pan as the onions, and when those were done, drained off the grease and then into the pool with the potatoes and onions. 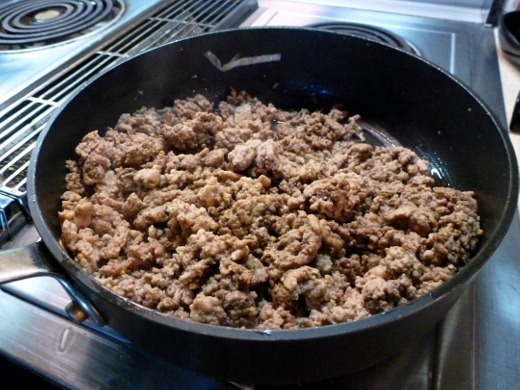 To season, I started with salt and pepper, a teaspoon of allspice, and then a teaspoon of poultry seasoning. I think the two teaspoons the recipe calls for might’ve been a bit much, and the poultry seasoning gave it a nice depth of flavor. 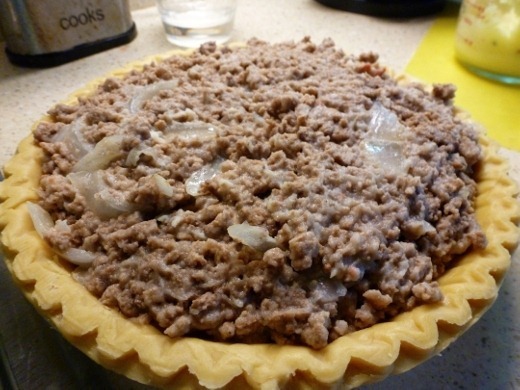 Once the big vat of meaty filling was ready, it was ready to work my pie crust. Using two premade shells, I filled the first one up *to the brim* (and then some) with the mixture, and then inverted the other shell, removed the crimpled edges, and placed that on top. 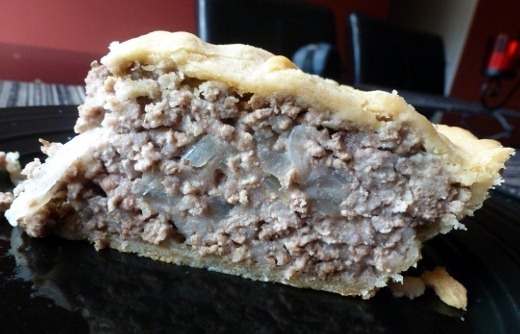 Pop it in the oven for about 35-40 minutes and then you’ve got yourself a meat pie. This thing was so dense and filling that it fed me that night, Meg and I for the following lunch, and then again the next dinner (check behind the BLTs in the previous post to see the meat pie! ).